Yup, you read that right. And it’s not the first time I’ve made it; I got curious and used Kath’s recipe years ago and didn’t hate it. I’ve had a can of sardines in the pantry for a little while now (our co-op sells them 2 for $4) and felt the need to break it open sooner rather than later. While I could have simply pretending I was making tuna salad and mixed it with some celery, dill pickle, egg white and onion, I decided I’d break out some of my cookbooks to see if they had anything to say. So, I whipped up the salad with some homemade mayo (instead of the plain Greek yogurt) and served it in various ways: with crackers, on salad topped with crackers (below) and on a whole-wheat English muffin. I’d like to challenge anyone who already eats canned salmon to try sardines. The authors note in the book that sardines are sustainable and don’t have mercury (because they’re at the bottom of the food chain and don’t concentrate heavy metals). Sardines are high in protein, omega-3 fats, Vitamins B12 and D and calcium. They only have a *slightly* more ‘pronounced’ flavor than tuna or salmon, and–in fact–I’d say it’s less fishy and more brine-y or salty. So, give it a whirl! 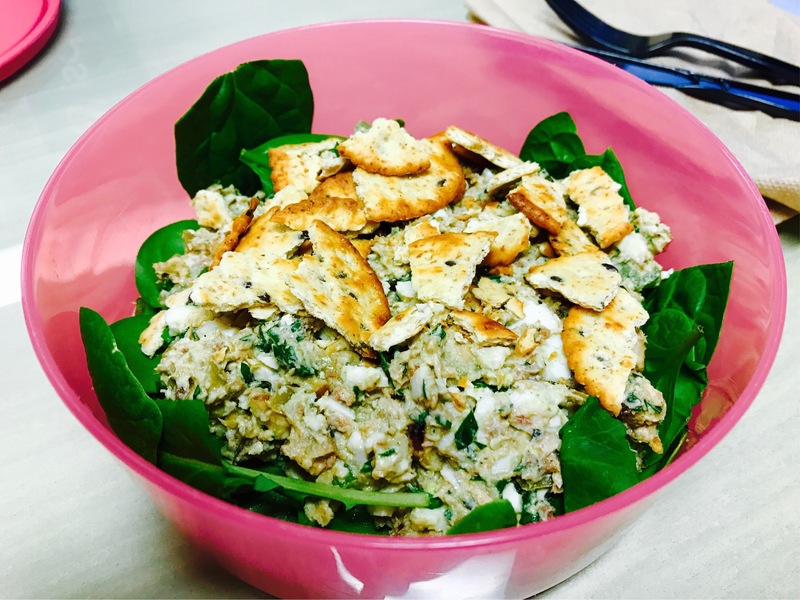 I loved the mix-ins with this salad, which included mashed hardboiled eggs, parsley, celery and toasted walnuts and olives with a little bit of Dijon mustard. It was salty and rich and paired really well with wheat crackers. Remember when I entered that recipe contest a couple weeks ago and asked for you to vote for me?? Well, I won! I didn’t win the whole thing, but I did come in second place in the judges category, and received a sweet little gift box in the mail! I’m excited to make my own recipe again, and there are a couple other recipes that sounded interesting, like Ground Beef and Quinoa Stuffed Acorn Squash and the Spicy Beef Burrito Bowl. Thank you to everyone who voted for me on the http://www.nutritioulicious.com/ website! I enjoyed tweaking the recipe and hope to do more of this in the future. 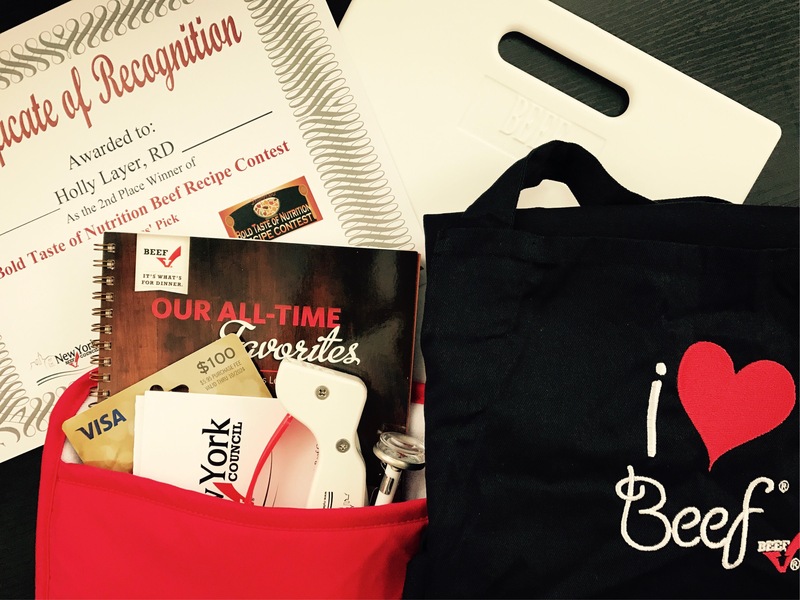 Also, thank you to the New York Beef Council for facilitating and judging the contest. I’m looking forward to going on a farm tour this coming summer (I was supposed to this past summer but had to have minor surgery and wasn’t able to walk around that day). Perhaps my steak and eggs will be on the menu next week! Disclaimer: By posting this recipe I was entering a recipe contest sponsored by The Beef Checkoff and New York Beef Council, and was eligible to win prizes associated with the contest. I was not compensated for my time.